Although the earnings data was solid and the unemployment rate reached its lowest level since November of 2007, the focus on Friday's data was unquestionably upon the poor headline payroll figure. Small wonder, too: it was the third-largest miss since the beginning of 2010 and the first time that payrolls have disappointed vs the consensus for three consecutive months in more than five years. Beyond that, the absolute level of the data was poor. To be sure, it was impacted by the Verizon strike that will offer some give back in the future, but even without it the number would have been a stinker. With it, it was the worst non-census influenced monthly headline figure since February of 2010. 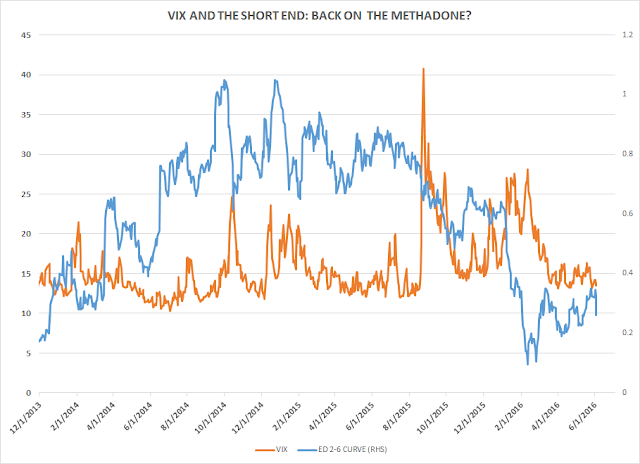 The market reaction was as predictable as it was tiresome. Fixed income rallied hard, with market pricing of a tightening by July getting eviscerated. The cumulative probability of a hike dropped from 66% to 30%. It was carnage chez DXY as well, with nascent dollar longs treated to a lengthy consultation at Dr. Market's proctology clinic. As noted on Friday, the move in USD/JPY appears to be largely in keeping with the fundamentals. Although the MXN was clearly a laggard, it still appreciated on the day, which isn't what you'd expect if there were truly a US growth scare. Indeed, the loony (equally vulnerable to weak US growth) was one of the star performers of the day. 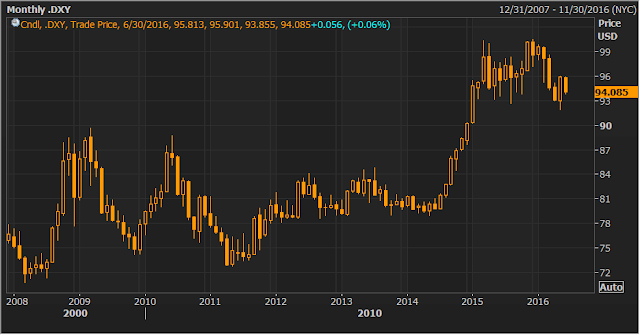 On a strategic basis, the DXY has put in three overlapping waves from the highs on the monthly chart, which Ellioticians could label an A-B-C. Given last month's bullish candle, the implication would naturally follow that the dollar should bat on and register further gains. Obviously, last Friday's price action out the cat amongst the pigeons when it comes to that theory. The zillion dollar question (for today at least) is whether Yellen will execute another handbrake turn to pivot uber dovish once again or whether she'll echo the message of the April minutes and keep her options open. To be sure, the last two Fed governors to speak- Powell and Brainerd- sounded like they were in no rush to adjust policy. Of course, by virtue of sitting at the head of the table Yellen has a special responsibility to provide a more holistic message rather than simply expressing a personal view. What should she do? Well, an obvious suggestion would be "don't panic". 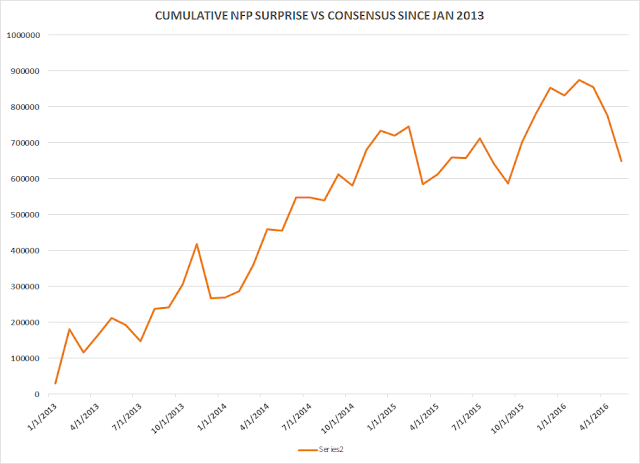 After all, despite the recent payroll disappointments, the cumulative positive surprise since the beginning on 2013 has been solidly positive. If the Fed hasn't reacted to the upside surprises (if they had, rates would be quite a bit higher than they are now) should they really react at the first whiff of downside surprise? Insofar as Fed rhetoric helps to shape economic expectations, the seemingly perennial focus on the downside does the economy few favors. Yes, risk management is an important part of the Fed's job, but the seemingly constant Debbie Downer message of the last few years is reminiscent of a doctor who tells each patient that every ailment is potentially terminal. In reality, things have moved closer to the Fed's mandate, even over the past few months. 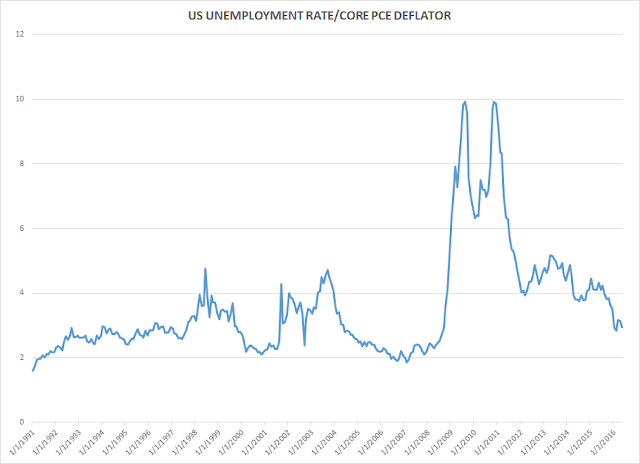 If we think of policy targets of 5% for the unemployment rate and 2% for core PCE inflation, then measuring the ratio of these two can provide a simple gauge of the distance from the ideal economic settings (a ratio of 2.5.) As you can see, the ratio has fallen sharply, even over the past few months, and now currently rests at 2.95. By way of comparison, the average ratio for 1995-99 (seen as such economic halcyon days that Hillary Clinton is trotting out Bill with a promise to "recapture the magic") was 3.06. 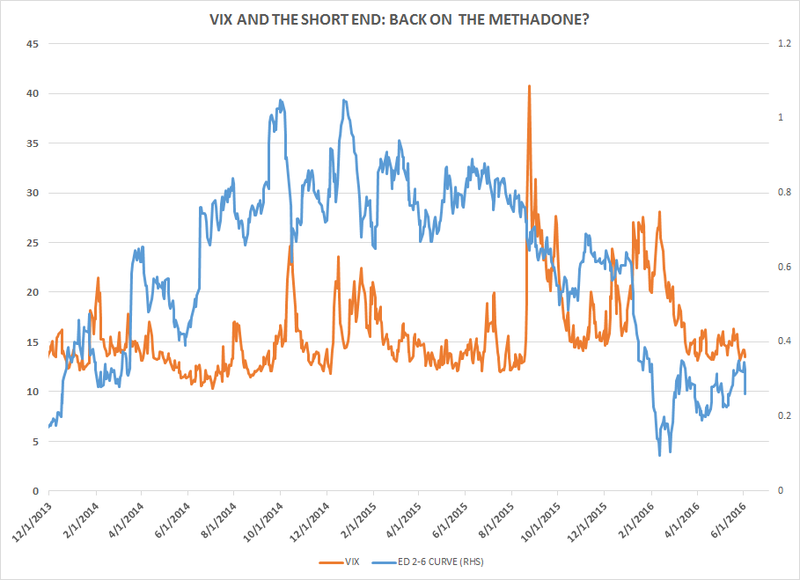 And of course, there's the fact that despite the poor data on Friday, US equity indices were only slightly down (still close to the highs in the case of the SPX) and VIX actually went down. Yes, it was a Friday, but would the latter be the case if the market were really worried by that figure? Or is it a case of the market expecting its favourite lapdog to roll over when ordered yet again? One thing is clear, however; since the Fed began to dial back its QE program, there has never been so little tightening priced in with vol this low. Now, sceptics and/or owners of several hundred billion dollars' worth of bonds might well point to the non-manufacturing ISM is a source of disquiet and a reason for Yellen to capitulate for what seems like the umpteenth time. And perhaps they are right. But from a financial stability perspective, equities taking a "heads I win/tails you lose" approach to economic data, at the highs, with P/E's above historic norms, doesn't strike your author as a scenario that is likely to end well, particularly if policymakers are deemed to be at the beck and call of the market. And so, squaring the circle, while it may seem odds on the Yellen capitulates today, there must be a nonzero chance that she plays a straight bat and keeps her options open. After all, what's the point of closing the door? As such, if the reading of the DXY chart above is correct, then Friday's weakness represents a gilt-edged buying opportunity. The short term set-up in USD/CAD, for example, looks rather tidy and offers decent risk/reward with a stop below 1.29.
am not sure anyone mentioned Europe BRUTAL underperformance Friday. 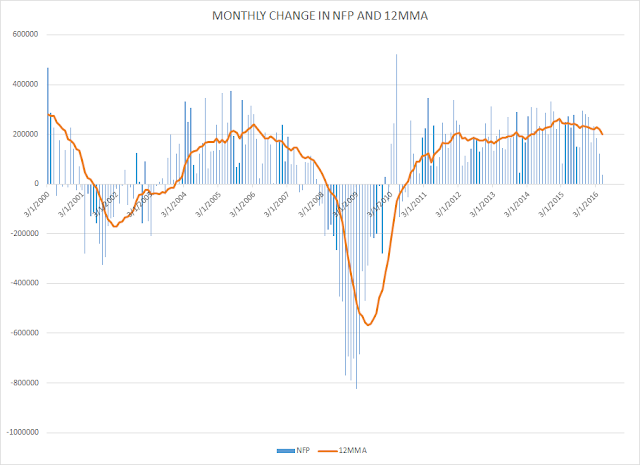 They took the NFP excuse to send indices sharply lowers and they took no prisoner. i have no clue about spoos - you'd think 1950 has to be tested in June/July, right? But this market does not react to logic. After topping in April 2015 Europe is still firmly and surely in a bear market so it's a much easier market to work with. There's another matter, concerning politics. I doubt Yellen & Co would fail to use any half-credible excuse to keep the party going until late this year, beyond election. I think they could hike now to get the market reaction early, then dovish for the rest of year with another hike in December. I think if Trump gets strong polls, it'll be overall negative for the market. MM - "What should she do?" Tend to agree with you. There seems to be good vibes coming from Jack Lew, who is in China for billateral talks. Reading between the lines, this could be China giving the thumbs up to the FED. Trimmed JPY long and added to DXY long. I suspect we are moving to a pre-recession trading condition. I would not want to be long dollar here, except perhaps short NZD.USD later in the week as there is a non-trivial chance the RBNZ cuts. Generally though, I suspect the commodity currencies have a reasonable run ahead of them for the remainder of the month. Nico, you are spot on for Stoxx and Spoos. Spoos are in their own world. Cannot use same logic with them. European stocks really constricting the range, we should see a break soon. "Venezuela's inflation rate is the highest in the world: it is expected to be at 720 percent by the end of 2016." Nicolás Maduro Moros, lauded by Nobel Prize winning economist Joseph Stiglitz, is the man of the hour. Why is he being ignored? @abee thx for that - to the extent being in complete agreement is tantamount to liking, you are correct! The US infrastructure stuff is definitely the end game, the interesting puzzle is what would need to happen to force it, and I think we would all agree pulling something like that off is impossible pre-election unless its a 2008 style disaster, which is not my base-case. In Europe biggest fear is that Draghi could do more easing to offset Jellen put... negative rates are killing banks: banks are theorically cheap in a P/Bv ratio but it works only if you close bank today and redeem all balance sheeet BUT if you keep banks as a viable entities they are money losing machine in a negative rates enviroment with flat curves (in a low growth, sclerotic, etc economic area, no volatility, low turnover of money). markets are going crazy and totally disconnected... i've a bad feeling here.. Question at the front of my mind is whether there's enough data between now and the July meeting for the Fed to satisfy itself that jobs have slowed to no worse than a 100-150k range. Though I cut and run from DXY and summer rates positions right after Friday's report, I do agree with abee and washed that this Fed wants to hike so long as stocks are buoyant. They have to take the chances the market gives them, but would look foolish, given all their "data dependent" rhetoric, doing so in June. We've now seen Rosengren calling the data "choppy," and Brainard calling it "mixed." 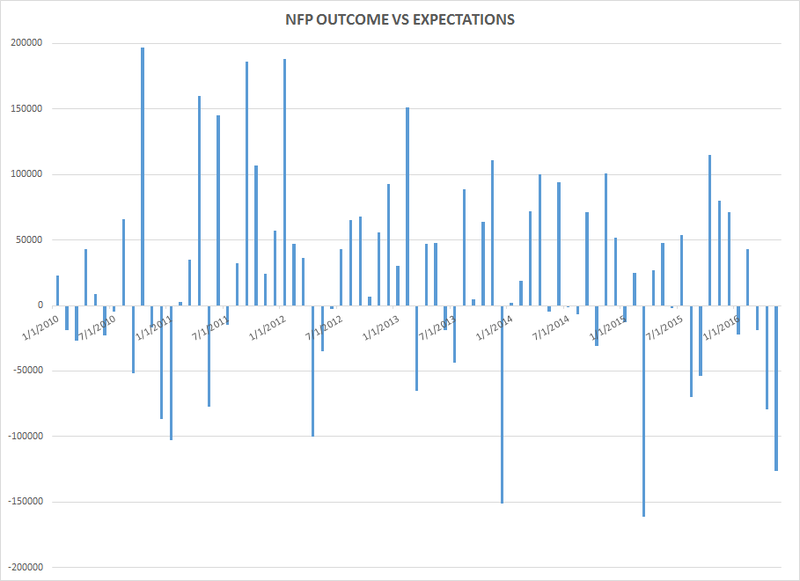 Are there materially higher than 30% odds (as implied by FF futures) that one remaining NFP report is going to change that? I don't have a strong view on that. And as for September, it's too far away for me to have any view given how fickle markets and data can be. I'm wondering what kind of lift a no-hike scenario in July will give to sentiment in gold. I thought it worthwhile buying some topside options there for a break through 1300 if the early July data isn't great. MM made some observations on MXN. That one perplexes me, looking cheap on most models. What gives? I guess, if the Fed doesn't hike it's likely because the US economy is weak, and Mexico being most exposed it follows that MXN should underperform. So perhaps it's just that if there's no hike it's bad for MXN, and if there is a hike it's also bad for MXN and EM generally (before Friday, I was looking to challenge that view), and therefore MXN should trade cheap. I have wondered whether there's something else going on here ... is it trading cheap because Nieto's approval ratings are so low and an anti-reform government (especially as concerns Pemex) is looking likelier after the next presidential election? The PRI got pasted in this weekend's gubernatorial elections, I note. Re GBP, I think MM may be right there -- that we have another bought of selling into the referendum, or rather, into the two longer running (and therefore most credible) phone polls, IPSOS and ComRes. My understanding is we may not see those until the week before referendum. TPX was surprisingly strong last night ... maybe JPY isn't headed straight to 100, even with the Fed on hold. Seems to me the Fed are going to push the market up into the election, then if Clinton wins, they push higher, if Trump wins they collapse the market. 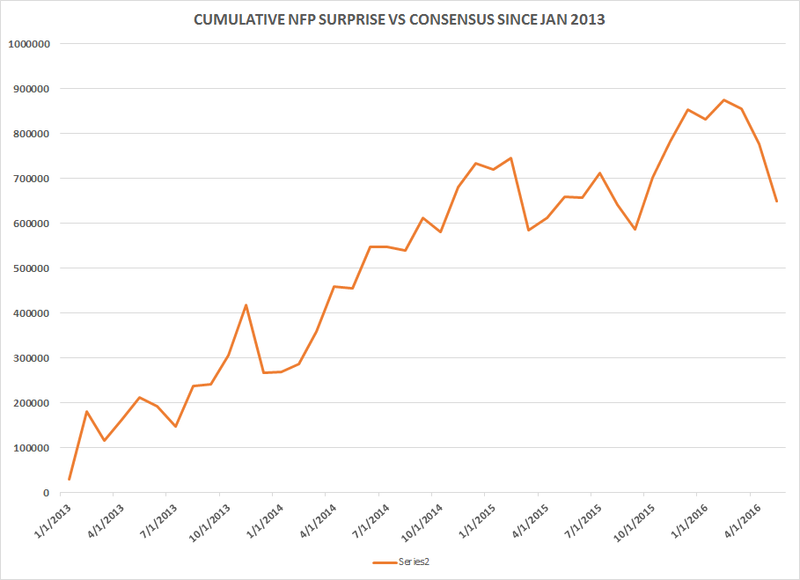 re MXN - according to MS, "Like never before, Luis found widespread confusion, frustration and more frustration among Mexico watchers with the performance of the peso. But that is a subject for another day." Bullard saying July is "possible" ... maybe it's possible for the view of the data to turn sufficiently positive. If not now, Janet, then when? If you hike now/July, there is very little risk, except to 12 year old dip buyers, and you can't possibly cause a recession, that's just plain silly, the difference between 25 bps, 50 bps and 75 bps will have no effect on the economy. You can, however, poke a hole in a speculative bubble and deflate a hot air balloon called Spoos, diverting capital out of overpriced high yield bonds and from unicorn stocks to savings and more productive direct investment in real businesses, and at the same time can ensure that you have some ammo for when the economy does turn down. Do it. We wonder, sadly, if she is now back to going The Full Carney, and simply jawboning occasionally while doing nothing. There is every chance the June jobs number is back on trend, but that would be a problem, as it would give participants less than two weeks to adjust positioning and it might make markets in July very difficult to manage, if the hand signals have not been put in place carefully well ahead of the July Fed meeting. Look for more hawk talk in the days and weeks ahead regarding the upcoming July rate hike, irrespective of what they do in June (nothing). Stronger data would then be used by the Fed to cement another hike in September. Brexit not happening would be (obviously) bullish for sterling, but also for USD as one of the largest negative event risks out there would be taken off the table. Agree with MM, one more washout in GBP and then long sterling might be a good punt? We like short EURUSD again here, as in general we are expecting a slow drift back up for DX after last Friday's shocker. The ECB bond purchase program is shortly to begin, and everyone and their uncle have front run this already, so we may well see a few participants exit the Eurozone and unleash a renewed bout of EUR weakness amid quite sloppy economic data. The prevailing opinion on the US jobs number does seem to be that it was indeed a one-off and that there will be a sharp snap back ahead. VIX back below 14. This market seems to be like a California forest in August - bone dry and full of dead timber and kindling. One spark and the whole thing will go up in flames. Where will it come from? Janet is in no mood to be a flame thrower, but it only takes a passing tourist with a cigarette to create a raging inferno. Half an eye open for a new high in USDCNY, once more? BofA/ML indicator of recommended stock allocations by Wall St strategists is currently showing a lower level than at the March 2009 lows. What?? How can you fall out of a ground floor window? The spark that lights the blast upward? When all those idiots are bullish and fully allocated we can talk about a correction. "I've got nothing for you on that," Yellen said. "We're very focused on doing our jobs and we'll just see what happens."